TEHRAN (FNA)- Activists clashed with police for a sixth day in Western France. Law enforcement officials used tear gas and water cannons against crowds protesting the demolition of their ‘eco-camp’ on the site of an abandoned airport. The biggest land occupation in europe still under attack. Anyone paying attention to the sordid story of council estate demolitions in London will know how hard it is to take politicians seriously — and especially Labour politicians — when it comes to telling the truth about their actions and their intentions. In addition, a collection of further lies are also disseminated, which divert attention from the fundamental injustice of the alleged justification for demolitions — false claims that the new housing will be “affordable”, when it isn’t; that part-ownership deals are worthwhile, when they are not; and that building new properties with private developers will reduce council waiting lists, when it won’t. The biggest lie of this whole “regeneration” racket, therefore, is that structurally sound estates must be knocked down, while, on a day to day basis, the second biggest lie permeates all discussion with the success of Goebbels-style propaganda — the lie that “affordable” housing is affordable. Boris Johnson, in his crushingly dire eight years as London’s Mayor, decided that “affordable” meant 80% of market rents, but that is clearly not affordable, as market rents are so dizzyingly overblown — and completely unfettered by any form of legislation — that people are often paying well over half their incomes in rent, when what was long regarded as fair was a third (similarly, buying a home is now unaffordable for most people, as prices have spiralled out of reach, with a huge deposit needed for a property that costs ten times a buyer’s annual salary, when the fair model of the past used to be that it should cost no more than three and a half times one’s annual income). Genuinely affordable rents are social rents, paid by council tenants and housing association tenants, which are generally a third of market rents, but it is these rents that central government, councils and, most recently, large housing associations, are trying to get rid of entirely. Behind it all is the stranglehold of Tory austerity, cynically implemented to destroy all public services, but few of those responsible for social housing are fighting back, and many — including many Labour councils — are actually gleefully engaged in social cleansing their boroughs of those they regard as an impediment to gentrification and wealthier incomers. But here the extent of the delusion ought to become clear. These coveted aspirational professional young people do exist, but they can barely afford to pay the kind of costs associated with a property racket that is only really interested in couples who earn over £70,000 a year, while anyone who earns less — and is regarded as “poor” by bloated public servants who have lost touch with reality — will probably end up being priced out of the future of endless towers of new housing that are largely being bought off-plan by foreign investors, who often leave their investments empty. Ironically, to keep most workers able to live in London, where, we should note, the mean income is no more than £20,000, compared to the average income, which is around £35,000, the government will end up having to subsidise cynically inflated new build rents, to add to the £26bn housing benefit bill, most of which goes to private landlords, when the only sensible way out of this spiral of greed is to defend social rents, stop knocking estates down, and embark on any number of visionary and large-scale not-for-profit social homebuilding projects to deliver new homes for social rent. City investors will be supportive of such a plan, because guaranteed rents over decades, even at socially rented levels, are actually a good investment, whose rationale has been lost in the forest of greed in which we currently find ourselves that is making life miserable for most renters, or driving them out of the capital altogether. Over the last few years, the horrors of the housing market have started to become more apparent to more people, withthe Heygate development in Southwark as a grim template. There, Southwark Council sold off a Brutalist estate that could easily but mistakenly be portrayed as a sink estate, to Lendlease, rapacious international property developers. The council made no money out of the deal, but Lendlease stands to make £200m from the Heygate’s replacement, Elephant Park, which will contain just 82 units of housing for social rent, when the original estate had over a thousand socially rented flats. The Heygate provided a template for the effective scrutiny of “regeneration”, but Southwark Council, greedy and contemptuous of its own constituents, failed to heeds its lessons, and has now started demolishing the Aylesbury Estate down the road, one of Europe’s largest estates. There has been noticeable resistance in Lambeth, to proposals to destroy two very well-designed estates, Central Hill andCressingham Gardens, and the false rationale for destruction becomes more transparent when architects and heritage bodies become involved. A powerful example of this is Robin Hood Gardens in Tower Hamlets, a visionary Brutalist estate, shamefully neglected, whose destruction is, however, well under way despite high-level support for its preservation. Another key battleground has been Haringey, in north London, where campaigners successfully derailed the first phase of proposals by the council to enter into a giant stock transfer programme with Lendlease, and last June the Grenfell Tower disaster brought into sharp relief, how, in the most horrific manner imaginable, the lives of those who live in social housing are regarded as inferior to those with mortgages. In autumn, Jeremy Corbyn intervened in the debate about social housing, using his conference speech to say that there must be no more estate demolitions without residents’ ballots. It was a high-profile intervention in the debate, and it set a marker for campaigners, and for the Labour left, but it lacks the teeth to stop destructive Labour Councils form continuing with their destruction, and Corbyn has persistently failed to follow up on this grand gesture by engaging in ground-level criticism of people like Peter John and Lib Peck, the leaders of Southwark and Lambeth councils respectively. What actually happened, as careful readers will realise, is that Khan was told — by his advisors, and by councils and developers — that deals that were considered to already be underway — even if they weren’t — had to be approved before any inconvenient new hurdles like ballots could even be considered. The list of estates, whose destruction was approved after the end of the consultation on the guidance for estate demolition (March 14, 2017) is below, and please follow the links for further information. And what’s particularly interesting, of course, is how only 17 of London’s 32 boroughs are involved, although most of those are Labour-controlled, which is surely something worth reflecting on with London’s local elections taking place next Thursday, May 3. Aylesbury, SE1 – 3,500 new properties, with Notting Hill Housing Trust, approved October 25, 2017. Ongoing destruction, particularly resisted by leaseholders facing Compulsory Purchase Orders, who secured a brief but significant success in 2016. Also see ‘The State of London’, and check out the 35 Percent campaign’s detailed accounthere. Elmington Estate, SE5 – 632 new properties, with Peabody Trust, approved January 22, 2018. Ongoing destruction. See ‘The State of London’, and check out the 35 Percent campaign’s detailed account here. Cressingham Gardens, SW2 – 464 new properties, approved December 1. 2017. Fenwick Estate, SW9 – 508 new properties, approved December 1. 2017. Estate near Clapham North tube station, subjected to ‘managed decline’ by council. No tenants’ perspective available online. Knights Walk, SE11 – 84 new properties, approved September 29, 2017. Small estate, partly saved in previous resistance involving ASH (Architects for Social Housing). South Lambeth, SW8 – 363 new properties, approved September 29, 2017. No tenants’ perspective available online. Lambeth Council’s page is here. Westbury Estate, SW8 – 334 new properties, approved September 29, 2017. Frankham Street, SE8 (aka Reginald Road) – 209 new properties, with Peabody Trust, approved January 22, 2018. Long-standing battle to save a block of 16 council flats (Reginald House) and Old Tidemill Garden, a community garden, from destruction as part of the redevelopment of the old Tidemill School. Alternative plans could easily preserve the garden and flats, but the council and Peabody aren’t interested. For the resistance, see here and here. Heathside & Lethbridge, SE10 – 459 new properties, with Peabody Trust, approved January 22, 2018. Connaught, Morris Walk and Maryon, SE18 – 1,500 new properties, approved January 15, 2018. Arthur Street, DA8 – 310 new properties, with Orbit Group Limited, approved December 22, 2017. Proposed development of an estate including three tower blocks in Erith. See Orbit Homes’ plans here, and this Bexley Times article. St. John’s Hill, SW11 – 599 properties, with Peabody Trust, approved January 22, 2018. The continuation of the destruction of a 1930s estates and its replacement with new properties because, as Peabody alleges,”the accommodation does not now fit the needs of residents.” They also note, “Phase 1 of the redevelopment (153 homes) was completed in April 2016 and includes 80 homes for social rent, 6 shared ownership and 67 private sale.” See Peabody’s page here. High Path, Eastfields, Ravensbury – 2,800 properties, with Clarion Housing Group, approved December 21, 2017. See development information about these estates in South Wimbledon (High Path) and Mitcham (Eastfields, Ravensbury) on the website of Clarion (formed from the merger of Affinity Sutton and Circle Housing in 2016) here. Alocal news article last May stated, “Clarion estimate there are currently 608 homes in High Path, 465 in Eastfields and 192 in Ravensbury. Including the replacement houses, about 1660 homes will be built in High Path, 800 in Eastfields and up to 180 in Ravensbury. This means that after the replacement homes have been built for the existing tenants, an extra 1,800 homes will be available to rent and buy.” No mention was made of what these new rental costs might be. Ham Close – 425 properties, with Richmond Housing Partnership Limited, approved November 17, 2017. See the Ham Close Uplift website for further information. Cambridge Road – 2003 properties, approved October 10, 2017. See the council’s plans here for the redevelopment of the site, which includes three tower blocks. For the residents’ association, see here, and also check out this local news article from 2016. Aberfeldy Estate (phases 4, 5 & 6), E14 – 206 properties, with Poplar HARCA Ltd, approved October 18, 2017. Blackwall Reach, E14 – 1,575 properties, with Swan Housing Association, approved March 23, 2017. This is a much-criticised project that involves the destruction of Robin Hood Gardens, the acclaimed Brutalist masterpiece, which was, indeed, an extraordinary creation, although it was severely neglected by Tower Hamlets Council as part of very deliberate “managed decline.” For more, see ‘The State of London’ here and here. Chrisp Street Market, E14 – 643 properties, with Poplar HARCA Ltd, approved October 18, 2017. This contentious project involves the destruction of the first purpose-built pedestrian shopping area in the UK, created for the Festival of Britain in 1951, and associated housing, although it has met with strong local resistance, and was put on hold by the council in February 2018. See a City Metric article here. Exmouth Estate, E1 – 80 properties, with Swan Housing Association, approved March 23, 2017. The estate is just off the Commercial Road, but I can’t find any information available online. Grahame Park (phase B, plots 10, 11 & 12) – 1,083 homes, with Genesis Housing Association Ltd, approved November 24, 2017. For the council’s plans for this estate in Colindale, see here. They claim that, with Genesis, as “the developer and resident social landlord”, who have now merged with Notting Hill, they will build approximately 3,000 homes by 2032, including around 1,800 new private homes, around 900 new “affordable” homes. In addition, “Approximately 25 per cent (463) of the original homes will be retained and integrated into the new development.” Also see the Notting Hill Genesis page here. South Kilburn Estate (various phases) – 2,400 homes, with Notting Hill Housing Trust, Network Homes Ltd, L&Q and Catalyst Housing Group, approved October 23, 2017. Ongoing destruction. For the Observer, Rowan Moore was full of praise for the new development in 2016, stating, “Thanks to the enlightened thinking of Brent council and Alison Brooks Architects, a notorious London estate that featured in Zadie Smith’s White Teeth is now the site of some of the best housing in the neighbourhood.” See Brent Council’s pagehere, and also see a review on the Municipal website here. Alma Estate, EN3 – 993 homes, with Newlon Housing Association and Countryside, approved November 15, 2017. Napier House and New Plymouth House – 200 homes, approved January 31, 2018. Waterloo Estate – 994 homes, approved January 31, 2018. Orchard Estate (former Mardyke) – 55 homes, with Clarion Housing Group, approved December 21, 2017. Queen Street Sheltered Housing Scheme – 6 homes, approved July 17, 2017. Solar, Serena, Sunrise Sheltered Housing Scheme – 54 homes, approved July 17, 2017. Gascoigne West (Barking Town Centre) – 850 homes, approved July 27, 2017. William Sutton Estate, SW3 – 270 homes, with Clarion Housing Group, approved December 21, 2017. Wornington Green, W10 – 1,000 homes, with Catalyst Housing Ltd, approved January 8, 2018. Friary Park – 476 homes, with Catalyst Housing Ltd, approved January 8, 2018. Havelock Estate – 922 homes, with Catalyst Housing Ltd, approved January 8, 2018. Green Man Lane – 770 homes, with A2Dominion Homes and Rydon/FABRICA, approved November 7, 2017. South Acton – 2,600 homes, with L&Q, approved November 7, 2017. Andy Worthington is a freelance investigative journalist, activist, author,photographer, film-maker and singer-songwriter (the lead singer and main songwriter for the London-based bandThe Four Fathers, whose music isavailable via Bandcamp). He is the co-founder of the Close Guantánamo campaign (and see the latest photo campaign here) and the successful We Stand With Shaker campaign of 2014-15, and the author of The Guantánamo Files: The Stories of the 774 Detainees in America’s Illegal Prison (click on the following for Amazon in the US and the UK) and of two other books: Stonehenge: Celebration and Subversion and The Battle of the Beanfield. He is also the co-director (with Polly Nash) of the documentary film, “Outside the Law: Stories from Guantánamo” (available on DVD here — or here for the US), and for his photo project ‘The State of London’ he publishes a photo a day from six years of bike rides around the 120 postcodes of the capital. To receive new articles in your inbox, please subscribe to Andy’s RSS feed — and he can also be found onFacebook (and here), Twitter, Flickr and YouTube. Also see the six-part definitive Guantánamo prisoner list, The Complete Guantánamo Files, the definitive Guantánamo habeas list, the full military commissions list, and the chronological list of all Andy’s articles. Please also consider joining the Close Guantánamo campaign, and, if you appreciate Andy’s work, feel free tomake a donation. Over the last few years, the horrors of the housing market have started to become more apparent to more people, with the Heygate development in Southwark as a grim template. There, Southwark Council sold off a Brutalist estate that could easily but mistakenly be portrayed as a sink estate, to Lendlease, rapacious international property developers. The council made no money out of the deal, but Lendlease stands to make £200m from the Heygate’s replacement, Elephant Park, which will contain just 82 units of housing for social rent, when the original estate had over a thousand socially rented flats. 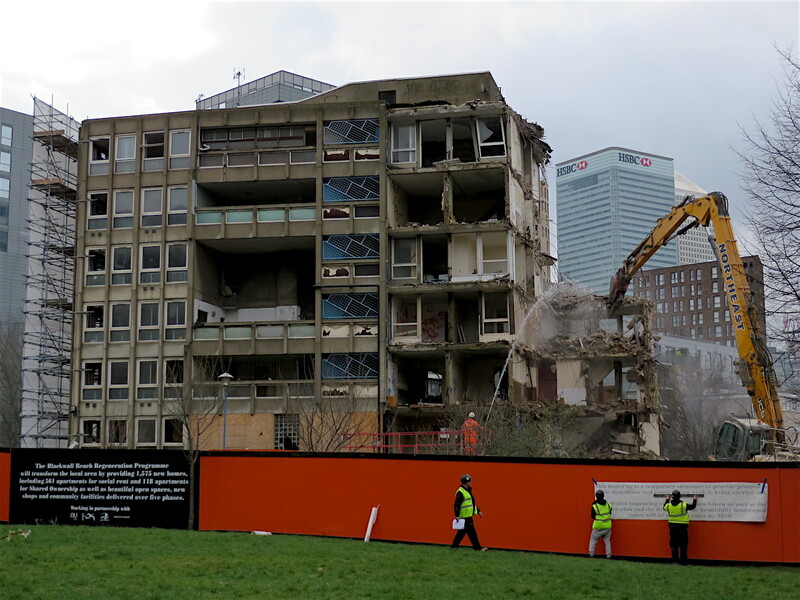 The Heygate provided a template for the effective scrutiny of “regeneration”, but Southwark Council, greedy and contemptuous of its own constituents, failed to heeds its lessons, and has now started demolishing the Aylesbury Estate down the road, one of Europe’s largest estates. There has been noticeable resistance in Lambeth, to proposals to destroy two very well-designed estates, Central Hill and Cressingham Gardens, and the false rationale for destruction becomes more transparent when architects and heritage bodies become involved. A powerful example of this is Robin Hood Gardens in Tower Hamlets, a visionary Brutalist estate, shamefully neglected, whose destruction is, however, well under way despite high-level support for its preservation. Ongoing destruction, particularly resisted by leaseholders facing Compulsory Purchase Orders, who secured a brief but significant success in 2016. Also see ‘The State of London’, and check out the 35 Percent campaign’s detailed account here. See development information about these estates in South Wimbledon (High Path) and Mitcham (Eastfields, Ravensbury) on the website of Clarion (formed from the merger of Affinity Sutton and Circle Housing in 2016) here. A local news article last May stated, “Clarion estimate there are currently 608 homes in High Path, 465 in Eastfields and 192 in Ravensbury. Including the replacement houses, about 1660 homes will be built in High Path, 800 in Eastfields and up to 180 in Ravensbury. This means that after the replacement homes have been built for the existing tenants, an extra 1,800 homes will be available to rent and buy.” No mention was made of what these new rental costs might be. Ongoing destruction. For the Observer, Rowan Moore was full of praise for the new development in 2016, stating, “Thanks to the enlightened thinking of Brent council and Alison Brooks Architects, a notorious London estate that featured in Zadie Smith’s White Teeth is now the site of some of the best housing in the neighbourhood.” See Brent Council’s page here, and also see a review on the Municipal website here. Join the Land Justice Network for a walking tour of London’s land and housing crisis on Saturday 14th April 2018, 1pm-4pm. Meet 1pm in Brown Hart Gardens on Duke St, near Bond St Tube. Facebook event here. Join us for a tour of some of the most expensive locations on the Monopoly board: places that Dukes and Earls inherited as fields hundreds of years ago, but now – thanks to a lucky roll of the dice – is some of the hottest super-prime real estate on the planet. Along our route, you’ll see Mayfair mansions left empty for nearly 15 years, discover properties owned in offshore tax havens, and find out the truth about who owns London. It’s time for change. The Land Justice Network has organised this tour to showcase some of the root causes of London’s land and housing crisis – and call for change. The Landlord’s Game is part of a wider Week of Action….. The Land Justice Network (LJN) has called a Week of Action around the theme of ‘Lords vs Commoners’ for the 14th-22nd April. According to the Country Land and Business Association, 0.06% of the population own 50% of the rural land of England and Wales. The Week of Action is intended to draw attention to the current unequal distribution of land in England and Wales, by inviting you to organise an event in your area and share photos and stories of what you do. This could be a public meeting or protest or maybe a banner drop, occupation or mass trespass. Kuwaiti draft Security Council statement demanded an investigation into Gaza’s Land Day rallies in which 17 were killed. The United States has blocked a draft statement by the United Nations Security Council that called for an investigation into the killing of 17 unarmed Palestinian protesters near the Gaza Strip‘s eastern border. The statement, which was proposed by Kuwait, demanded an “independent and transparent investigation” under international law into the bloody events on Friday’s Land Day protests. The statement also expressed “grave concern at the situation at the border” and stressed “the right to peaceful protest”. Hanan Ashrawi, a member of the Palestine Liberation Organization (PLO) Executive Committee, condemned the US’ decision, describing the US and the UK as beingcomplicit in Israel’s persistent violations and violence. Meanwhile, Israel’s minister of defence Avigdor Lieberman rejected calls for an inquiry into the actions of the Israeli army. More than 1,500 others were wounded on Friday’s protest when Israeli forces fired live ammunition at protesters to push them back from Gaza’s border area, according to the Palestinian health ministry. The mass protests, called “the Great March of Return”, were organised by civil society groups and supported by all political factions to call for the right of return of Palestinian refugees. It marked the beginning of a six-week sit-in, starting on Land Day, an event that commemorates six Palestinian citizens of Israel who were shot dead by Israeli forces after protesting the government’s confiscation of large swaths of Palestinian land on March 30, 1976.